Bison are a type of even-toed ungulate bovines. They are the biggest mammals in North America. American bison live in river valleys, and on prairies and plains. Typical habitat is open or semi-open grassland, as well as sagebrush, semi-arid lands and scrublands. Some lightly wooded areas were known to have supported bison. Bison will also graze in hilly or mountainous areas where the slopes are not steep. Though not particularly known as high altitude animals, bison in the Yellowstone Park are frequently found at elevations above 8,000 feet and the Henry Mountains bison herd is found on the plains around the Henry Mountains, Utah, as well as in mountain valleys of the Henry Mountains to an altitude of 10,000 feet. American Bison are large, plant-eating mammals that are similar to cows. Even though they are often called buffalo, they are not really related to them. They used to wander around the prairies of North America in huge herds. There used to be as many as 30 million bison in the United States, but because of hunting, by 1890, only 1,000 bison were left. Through conservation efforts, there are now more American bison than there used to be, but still far fewer than there were before the 1800s. ↑ Conger, Cristen. "What brought bison back from the brink of extinction?". HowStuffWorks.com. 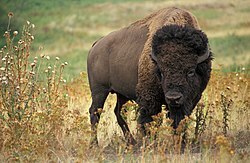 http://animals.howstuffworks.com/endangered-species/bison-extinction.htm. This page was last changed on 4 February 2014, at 14:21.